The weekly GTA Online has arrived and along with the usual, double goodies comes the 70s-style Tulip Muscle Car. Who doesn’t like the sound of a massive engine rumbling to life when they turn the key? 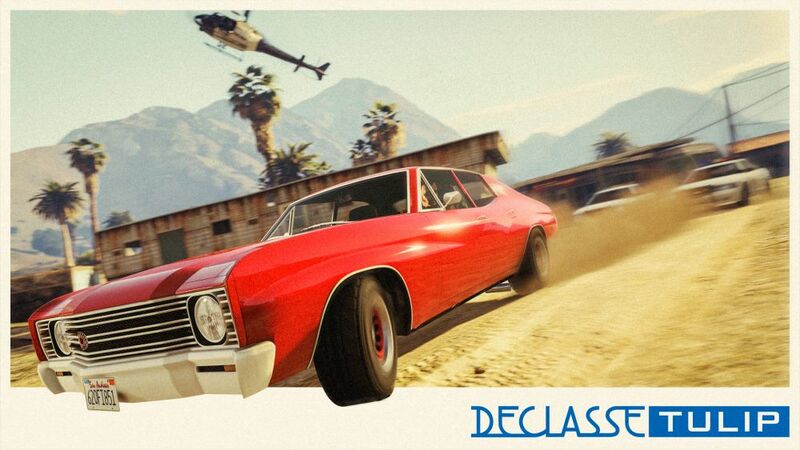 GTA Online players can do just that with Declasse’s new Tulip Muscle Car included with today’s update. Just head over to Southern San Andreas Super Autos and pick one up today. In addition to double GTA$ on all Smuggler’s Run Cargo Sales, this week, you can earn 2x GTA$ & RP when you play select classic Adversary Modes through January 21. Here’s the list: Tiny Racers, Dawn Raid, Overtime Rumble, and Power Mad. Those in the market for some new duds can play GTA Online anytime this week to unlock the Declasse Girl T-Shirt. If you’re looking for a deal, Hangars and select aircraft are up to 40% off. Select high-end and weaponized vehicles are also discounted for up to 35% off. If you need some tips on the latest content update Arena War in GTA Online, we have you covered. Vehicle prices, upgrades, modes and gameplay information can also be found through that lovely link. The post GTA Online players can now burn some rubber with the Tulip Muscle Car appeared first on VG247.